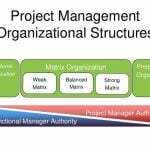 The projectized organization has all the resources aligned around projects. The project managers have complete control over the resources working on their projects. The biggest advantage of the projectized organization is that the resources have loyalty to their projects and project execution becomes easier. 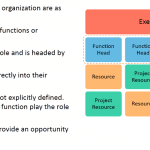 This kind of structure is suitable for organizations whose work is in the nature of projects. There are few disadvantages in this structure as well. Firstly, the role of the resource is over once the project is completed. Secondly, highly specialized roles within a project may not be fully occupied all the time. For example, a purchase executive may have work for selected periods on a project while purchase activities are going on. However, for the rest of the period, their capability may not be optimally utilized. 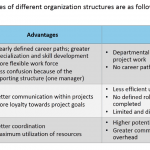 There is less scope for functional specialization, as the project boundaries limit the kind of work for the resources. 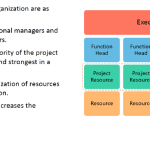 Each project manager is in-charge of a project and its resources.